For your convenience to contact Icici Bank We have provided all possible information of Icici Bank. You can contact Icici Bank on the given phone number +91-22-26531414, 33667777. To know the address location of Icici Bank it is also presented here ICICI Bank Towers, Bandra-Kurla Complex, Mumbai 400 051, Maharashtra, India. Contact them by sending email to Icici Bank you will find an email address here customer.care@icicibank.com. To know more about Icici Bank, go to their website www.icicibank.com and collect all possible information from there. You can contact them from their website also. If you have any comment to post or you want to register a complaint against Icici Bank, you are advised to go to the below box and post your view there. ICICI Bank is one of the reputed Indian based financial institutions and considered second biggest banking and financial service in India. It is one of the largest banks in India in terms of assets owned and service provides. The bank began its journey in year 1994 by ICICI Limited an Indian financial institution, and at present it offers a broad range of banking products such as Personal Banking, Privilege Banking, Wealth Management, Private Banking, NRI Banking, Corporate Banking and Business Banking. Icici Bank has approximately 3,539 plus branches and 11,162 plus ATMs in all across India while also existed in 18 worldwide countries. Its Three subsidiaries are situated in United Kingdom, Canada and Russia while branches in United States, Singapore, Bahrain, Hong Kong, Sri Lanka, Qatar and Dubai. Apart from this, the registered offices are served in United Arab Emirates, China, South Africa, Bangladesh, Thailand, Malaysia and Indonesia. The bank has been integrated with few ICICI Group Companies such as ICICI Group, Icici Prudential Life Insurance Company, ICICI Securities, ICICI Lombard General Insurance Company, ICICI Prudential Amc and Trust, ICICI Venture, ICICI Direct, ICICI Foundation and Disha Financial Counseling. Moreover, ICICI Bank also provides online banking service via Internet and Mobile that customer can easily operates its account and get the Benefits of bank's plans and services while it has its own mobile application which is used easily in iPhones, android phones, tabs etc. ICICI bank has promoted many notable financial institutes Credit Rating Information Services of India Limited, National Commodities and Derivatives Exchange Limited, Credit Information Bureau of India Limited, Entrepreneurship Development Institute of India and North Eastern Development Finance Corporation etc. ICICI Bank is an Indian largest and fastest moving company in banking sector. It is a privately held company that offers a broad line of banking and financial services like credit cards, Consumer banking, corporate banking, finance and insurance, investment banking, mortgage loans, private banking and wealth management services. Apart from that, it also provides mobile banking, online banking and ATM services. The company started its Internet banking service in the year 1998. ICICI Bank began operations in 1954 in India. Today, it has a global presence with its offices and subsidiaries in over 19 countries, among them few are the United States, Russia, Qatar, Canada, the United Kingdom, Singapore, Sri Lanka, Hong Kong etc. Its principal international subsidiaries are ICICI Bank UK PLC, ICICI Bank Canada, ICICI Securities Holdings Inc., ICICI International Limited and ICICI Bank Eurasia Limited Liability Company. The company operates more than 3,611 branches and around 11,162 ATMs in India. Corporate office of the company is located at ICICI Bank Towers in Mumbai, India. ICICI is the best known for its investment banking, life insurance and asset management services.The company's shares are listing on the Bombay and New York Stock Exchanges. On the other hand, it has a secondary listing on the New York stock exchange under the ticker symbol 'IBN'. In the year 2013, ICICI Bank has been awarded with the titles of "Best Private Sector Banker", "Most Innovative Bank", "The Best domestic bank" and more. As of 2012, it had the Revenue of US$ 13.52 billion and around 81,254 employees. The customer care number of Icici Bank can be contacted from Bhubaneswar, Salem, Kanpur, Ludhiana, West Bengal, Madhya Pradesh, Faridabad, Pondicherry, East Delhi, Bhopal, Hyderabad, Mangalore, Vellore, Thane, Erode, Patna, Andhra Pradesh, Shillong, Indore, Coimbatore, Jammu, Raipur, Visakhapatnam, Ahmedabad, Patiala, Amritsar, Udaipur, Rajkot, South Delhi, Jamshedpur, North Delhi, Bihar, Dehradun, Trivandrum, Pune, Aurangabad, Delhi, Mysore, Ernakulam, Nasik, Mumbai, Kerala, New Delhi, Vijayawada, Meerut, Gurgaon, Goregaon, Trichy, Goa, Chennai, Navi Mumbai, Agra, Rajasthan, Ghaziabad, Punjab, Baroda, Sangli, Gwalior, Assam, Jalandhar, Vadodara, Kolkata, Bangalore, Himachal Pradesh, Karnataka, Allahabad, Gujarat, Noida, Madurai, Lucknow, West Delhi, Uttar Pradesh, Chandigarh, Uttarakhand, Nagpur, Surat, Jaipur, Jharkhand, Ranchi, Cochin, Orissa, Maharashtra, Gorakhpur, Chhattisgarh, Tamil Nadu, Varanasi India, etc. The headquarters of ICICI Bank is located at ICICI Bank Towers, Bandra Kurla Complex, Mumbai and its contact number is, +91 22 26531414. ICICI Bank has established its registered office at Race Course Circle, Vadodara, Gujarat and its phone number is +91-265-6617200,6617204, 6617205. The customer can contact its North Zone office at 011-42218579; South Zone office at 040-41068810; East Zone and Andhra Pradesh at 033-44025450 and West Zone at 022-66966021. Toll Free Number of ICICI Bank: 1800-22-4848, 1800 102 4242 Toll Free Number for Wealth and Private Banking: 1800-103-8181 Customer can contact at above mentioned numbers between the timings: 9 am to 6 p.m. The customer care lines of the bank are open from Monday to Friday. Customer can view the branch numbers of their respective cities at this page: www.icicibank.com/customer-care.page. 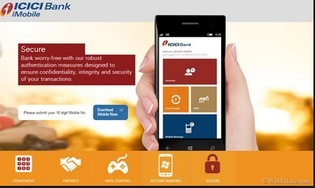 ICICI Bank also allows its customer to let bank through mobile phone by its apps and SMS banking. They can perform many functions like money transferring, bill payment, ticket booking, recharges and location tracking. ICICI Bank has launched its line of mobile apps for various Smartphone platform ranging from Windows, Android, iOS, Blackberry and Java. For more information and downloading procedures of ICICI Mobile banking apps, please visit at this link, www.icicibank.com/mobile-banking/download.page. ICICI Bank features a range of cards categorized into Credit Cards, Debit Cards, Prepaid Cards, Travel Cards, Unifare Metro Cards, Corporate Cards and Merchant Services. Search in google Icici Bank with the name Google Plus, Facebook, Twitter, linkidin Pages and you will find more information on these pages. Search in google like Icici Bank Google Plus Page. When you call to Icici Bank, ask for toll free number to enjoy charge free calling. At the first step When you call to Icici Bank please do not forget to tell them that you have found their contact number on findbusinessaddress.com.